The Emergency Room is the place I may find myself at soon after I dive out of the window to escape from the A-Z challenge. It's an onerous kind of thing to blog every day because there are days when quite frankly I don't feel like blogging. Like today, tomorrow and the next. Still the emergency room is a no brainer because I've made too many visits; even though it was called Casualty back home. 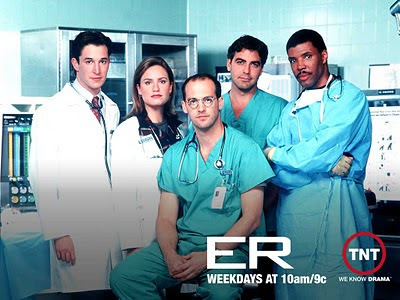 There was even a show of the same name, although it wasn't the sort of drama that would attract George Clooney of ER. George Formby, more like. I made my first visit to casualty when I was about two-years-old after my parents rather kindly left some shards from a broken bottle in the bath. They swear it was an oversight and social services were not called on. Still I never pass up the opportunity to remind them. Although the cuts weren't severe I still remember a night of terror under artificial lights and butcherous figures milling around wearing green masks. The second incident was during my adolscence when my Superman-style dive onto a bed ended in a good deal of Lois Lane. I don't want to elaborate on this one much given its embarrassing nature. Incident three was during my first term at university. I had the advantage of a top floor room directly above my 'friend' Andy. This was particuarly handy because it meant every time he stuck his head out of the window, I could tip water from my plant jug on his head. On one occasion, his head disappeared as if he had been shot shortly after I soaked him and there was a pounding on the stairs. Suddenly Andy was in my room, throwing a bucket of water at me. Expecting such a dirty trick I had refilled the jug. I chased him down the corridor. He closed the glass fire door. I went through it. Bleeding profusely from the head and chest I retreated to the bathroom. Surinder, a medical student, saw my plight, laughed loudly and ran outside chuckling. He later landed a top job on Harley Street. I still bear the scars. A good five years later I had my next brush with the emergency room. The scene was Wales on a windy day and we decided to tackle the mountain Snowdon the hard way along a narrow ridge. We had sneakers and our belongings in a plastic supermarket bag. Our waterproof jackets cost about $10 each and we had no map. The only thing we were lacking was T-shirts reading: "I want to be a statistic." Things went downhill fast, although not literally. Literally things went uphill and up a craggy peak called Crib Goch which apparently is a "knife edged" Arete; although I'd describe it more accurately as a big rocky pain in the backside. After hanging over a sheer side as we inched over the rocks, we made it to a narrow and slippery ledge. The peak of Snowdon appeared to be miles away in the mist. "This first part of the ridge is very exposed and serious, having resulted in several fatalities, even of experienced mountaineers," says Wikipedia, which wasn't much good because it wasn't around in those days. Martin's cheap sneakers slipped at one point and an experienced climber with all the appropriate gear came across the ridge bemoaning the treacherous weather conditions. "Oh my God. I'm going to die," Martin said in a thick Scottish brogue, looking ruefully at his mildew encrusted sandwiches in a Tescos bag. The thought of those sandwiches outliving Martin was too much. Galvanized into a panic we decided to head down a steep slope to knee aching, backside scraping safety. After numerous cuts and scrapes we reached a path. Unfortunately at this point a huge gust of wind picked up my backpack and propelled me off the path. I saw a rock heading towards my face and tasted blood. I had enough time to think: "This is the end." When I tried to get up I knew something was wrong. My left wrist had ballooned up and was clearly broken. We sat on the path in the driving rain wondering what way to return back. After about two minutes a man appeared, who turned out to be a ranger. Salvation had shown up out of the mist but the walk to a van and the jolting drive in a vehicle full of climbers groaning about their fractures is something I will never forget. I resolved to take up less dangerous hobbies in future such as checking out tea rooms. But every fracture has it's recompense. While Martin spent a windy night in a freezing campsite and saw the tent literally blown away I was in a warm hospital bed surrounded by nurses. And when I was released for the rest of the trip with a plaster cast on my arm, my plight endured maximum sympathy from every Welsh person I met including ladies in lacy hats. And let's face it Welsh people, and ladies in lacy bonnets in particular, are not normally known for their kindness to the English. I even had the satisfaction of getting Martin to tie my shoe laces. I made sure as many people as possible were watching. Notwithstanding these few perks I'd rather keep up my record of no admissions to ER for the last 20 years, unless you include a badminton-related sprain. For one thing it invariably tends to hurt. I haven't done a word count for this entry, but if I did I won't believe that you have difficulty blogging David. In fact I could feel that you rather enjoy it (sorry to be your antithesis). One thing this Challenge has done to me is just that - challenge me to write every.day.rain.or.shine. I can't let my mood or physically condition interfere. I feel good actually to be able to overcome the challenge. seems to me that with all the bloggers doing this A-Z business, things are bound to go silent come the beginning of may with everything being so thrilled to be done with it all! i don't think i've been to the ER for myself since i was 20 and got in a car accident, but i'd only been up by my airbag, nothing worse. Boy, for someone who'd almost rather spend time in the ER than to blog, you did a great job at presenting a meaty, substantial post...and quite a humorous one. Loved it. I'm now a follower. I didn't think much of it at first, but this A-Z sure is a challenging exercise! Hence why I didn't do this challenge. I have enough crap I need to write about with out it. And I could write a book about my emergency room experiences. I like this A-Z challenge you've started. 'Certifiably stupid' haha. 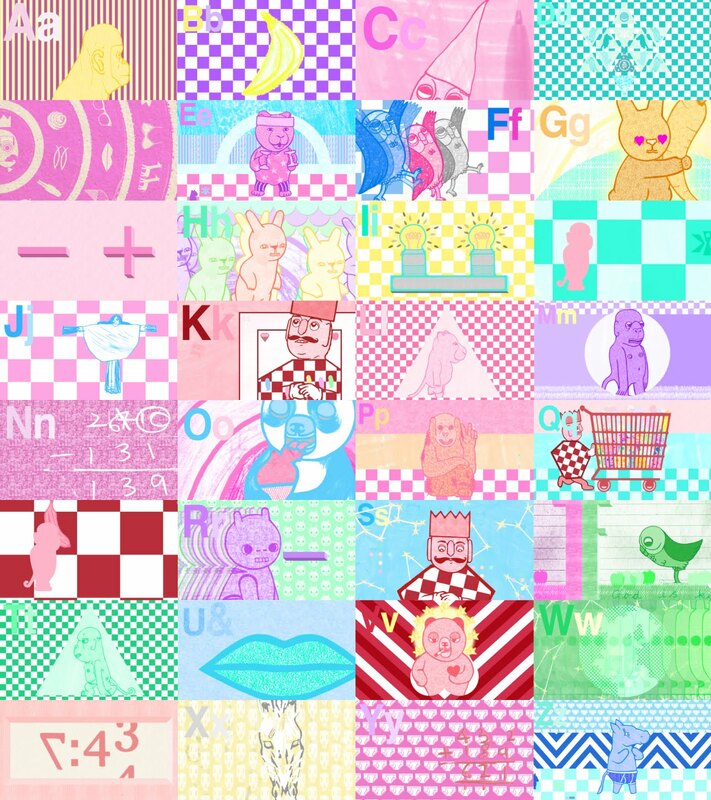 I used the alphabet a bit in an animation recently, i've posted a picture of the A-Z. Have a look at the A to Z here :) Looking forward to the next 21 letters.. I really enjoyed this post enormously. (Trying to add a few 'e' words in to the comments. If you need any help with the letter 'g' i have a post up at the moment that could offer some inspiration, do feel free to take whatever you need! I liked your Casualty/ER comparison by the way, very good. It is my other half who is the accident prone one rather then me. He broke his arm 7 weeks before we got married and at one point we thought he would have to have his own chair marked out for his use in A&E! Thanks for sharing so much about ER's ... I usually feel nauseous in an hospital....It's much easier to read about them..
Whatcan I say........I have never gone to ER for injuries unless one counts the time my feet got stuck in the cycle wheel... operated on, yes.....but have visited family confined there so often that I kind of feel nice out there. Enjoyed this. Haha well it all sounds painful (and probably expensive overall! ), but it also sounds like an adventure... or lots of them! And look at the stories you get to tell! oh, the pain and the e.r. sleepy now, i am taking a nap! oh my, what a story! Nice to meet you throught the A-Z challenge, hope to see you around!! Wow you live life on the edge, don't you? Haha! I'm glad you've been avoiding the ER lately though. Please don't jump out of a window. I'm glad you still have a sense of humor after all your E. R. incidents. I noticed you live in Suffolk, Virginia. In working my Family tree, I noticed a lot of my Ketchum descendants were from that area. Somehow I thought the name may have changed, like a lot of places did. I found you with the ‘surprise me’ button. I’m a new follower of yours. I'd love to have you check out my take on the A to Z Challenge, comment and follow, if you'd like. It certainly does Grandpa and once I start writing I can keep going easily. Oh well airbags are to protect you Sherilin; you are right - I'm having a break. Hmm - I don't think it does Li. Thanx for following Kelly, will shortly be following you too. It sure is Duncan. I am struggling tonight. Thans Martha, will be checking out you blog. Good stuff, well you post often anyhow, Oilfield. Thanx for visiting Armand, will be checking this out. Cool Frog - I should check it out. Thanks for the follo Ju - gosh you get a lot of new followers doing this, will return the favor. lol re the cycle wheel, Rek. For sure Allison, I got injured because I knew the A-Z thing would happen. Good stiff iZombie; will be checking out yours. Nice to meet you too bz. I'll try not to Jennifer, tho after today...Thanks Daisy, do aim to stay away from ER. Wow - the surprise button Kathy - must check that out, cool re Suffolk. David, your posts are keeping me sane through my journey through bullying, PLEASE do friends tomorrow, I could do with your quirky take on them! And look! you've got a squillion followers now - deservedly so. Those are great stories! I was a little nervous starting to read something with ER as the title, but you made it worth it. I've done some hill walking in Scotland (it's mountain climbing to this Florida girl), so I know how rough the terrain and weather can get. I don't have quite the record of no visits in 20 years. I went this past summer after an idiot smashed into the back of our van and I experiences strange headaches. No broken bones though.